Franklin, 1 vs. Hingham, 3 – Final – Sophomore Joe LeBlanc gave the Panthers the lead in the first period but Hingham scored three unanswered goals to secure the win. The Harbormen scored with 16 seconds left in the first to tie the game 1-1, then added two more tallies in the second period. Ray Ivers made 20 saves in net for Franklin. 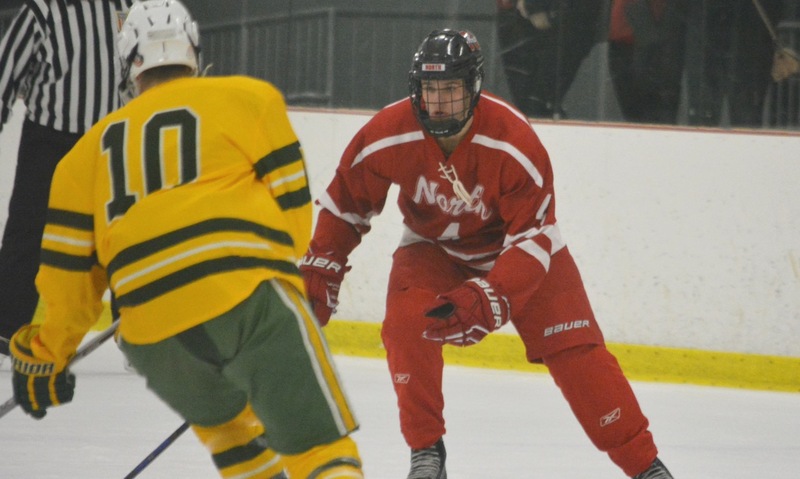 King Philip, 1 @ Norwood, 4 – Final – King Philip scored the equalizer in the second period to knot the score at 1-1 but Norwood grabbed the lead back minutes later and added two more in the third period to get the two points. Joe Boselli scored with 10 minutes left in the second period on an assist from Jack Coulter. James Lewis had 17 saves in goal. Oliver Ames, 5 @ Mansfield, 3 – Final – Click here for a Photo Gallery from this game. 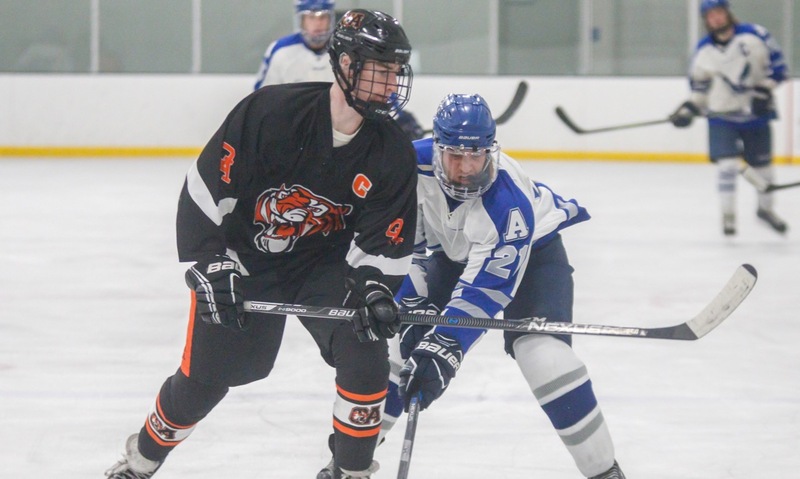 – The teams traded goals back-and-forth but Oliver Ames netted two goals in the final 10 minutes of play to get the win. Brett Williams gave OA the lead but less than a minute later, Mansfield’s Brad Grant tied the game. In the second period, Brian Grant put the Hornets ahead on a feed from Brad Grant but OA responded in two minutes as freshman Bryan Kearns buried a rebound off Max Ward’s shot. Williams put the Tigers up 3-2 with a power play goal late in the second but Mansfield sophomore Matty Copponi made it 3-3 with a goal early in the third. Colin Bourne scored the game-winning goal with 8:58 left in the game after Sean McCafferty stopped Jake Gottwald’s chance. Kearns added an empty net goal with just over a minute left. Owen Connor had 22 saves for the Tigers. FOXBORO, Mass. – It’s not an ideal scenario to surrender an early goal, but sometimes it can serve as a wake-up call. Such was the case on Wednesday evening, as King Philip scored just over two minutes into the game but the Mansfield boys hockey team responded in impressive fashion, eventually skating away with a 6-3 decision on the back of four power play goals. King Philip capitalized on a soft turnover early on to take the lead but the goal only seemed to spark Mansfield as the Hornets tacked on three goals over the final eight minutes of the period to seize a 3-1 lead, an advantage it never surrendered. “I thought the first goal woke us up, absolutely,” said Mansfield head coach Mike Balzarini said. “We’ve been in that situation before against Taunton and responded well. It’s been taking us a little bit to get going in the first but I’m proud of the way we battled back. KP sophomore Paul McDonald ended up with the puck on his stick after the turnover, carried towards goal and slid a pass across where sophomore Conor Cooke just beat the defenseman’s stick to one-time it into the goal for a 1-0 Warrior lead 2:08 into the game. From there, the period belonged to the Hornets. On the second power play chance of the frame, the Hornets cashed in. Sophomore Matty Copponi did the majority of the work down low before his shot hit the bottom of the crossbar and stayed out. However, senior Coleman O’Brien was right there to bang the loose puck in to tie it 1-1. The momentum stayed with Mansfield and the home team cashed in just a minute later. This time, senior Jack Garland won possession behind the net and tossed the puck in front to a wide open Jake Lund, and the senior bored it for a 2-1 advantage. The teams traded genuine scoring chances over the next two minutes with Mansfield senior Chris Copponi being turned away from KP goalie James Lewis (28 saves) and KP junior Ethan McGuire taking a pass from Luke D’Amico, but the shot was just over the net. Mansfield added to its advantage with 3:40 left in the period as Brad Grant drew a defenseman to the sideboards, took a hit while finding Garland in the slot for a one-timer and a 3-1 lead. KP had two good chances in the final minute on a power play but both Rocco Bianculli (slap shot) and Brendan Shandley (wrist shot) were turned away by Mansfield junior goalie Sean McCafferty (24 saves). After killing an early Hornet power play in the second, King Philip went on a 5-on-4 for five minutes. While having a couple of chances with the man-advantage, mainly Shandley’s low shot hitting off the post, the Warriors really took control when the Hornets were whistled for another penalty. On the 5-on-3, Bianculli delivered a perfectly weighted pass as he stepped in from the point across the ice to an open Ryan Fitzpatrick for a one-timer, bringing KP within a goal at 3-2. But the Warriors were done in by another penalty, this time an interference call while in possession in the attacking end. Mansfield needed just 20 seconds to cash in for its second power play goal, as Matty Copponi worked his way from the corner to in front of goal and got just enough on his backhand for the puck to cross and Mansfield took a 4-2 lead into the second intermission. A penalty-filled third period saw three goals, the first two adding onto Mansfield’s lead. After KP couldn’t convert on a man-advantage opportunity early on, the Warriors were whistled for a cross check with 5:53 to go. A minute into the power play. KP was hit with another penalty, and the Hornets went on a 5-on-3 power play. Mansfield quick cashed in with Grant firing a hard wrist shot from a tight angle into the back of the net. Just before his shot, KP was hit with another penalty so Mansfield’s two-man advantage continued after the goal. Just before one penalty expired, Garland took a feed from Kevin Belanger to make it 6-2. “We can’t stay out of the penalty box, no discipline,” said King Philip head coach Paul Carlow. “The same thing happened against North too. Playing at full strength, I thought we were every bit as good as [Mansfield]. At the end of the day, playing down a man, playing 5-on-3, you can’t win hockey games like that. Until we get it figured out, and play five-on-five….the league is too tough. If you take too many penalties, you won’t win. Mansfield was hit with three penalties in the final five minutes, and the Warriors cashed in on a 5-on-3 chance with under a minute to go. Fitzpatrick connected with junior Joe Boselli with a nice pass, and Boselli hammered it in with a one-timer. Mansfield boys hockey (5-1-1 Hockomock, 11-2-1 overall) move into first place in the Kelley-Rex with the win, holding a one-point lead over Franklin with two games to go. The Hornets travel to Asiaf Arena on Saturday for a big clash with Oliver Ames, who is just two points out of first place. King Philip (3-3-0, 7-6-0) is home with a 7:20 tilt against the Panthers. ATTLEBORO, Mass. – North Attleboro came into Saturday afternoon’s game with King Philip a game below .500 and already thinking about how many points it will need to ensure a playoff spot. When games are tough and points are at a premium, then it take goals of all kinds to build momentum. With one minute left to play, Jake Ebert fought his way to the crease and was the first to react when a shot slipped past KP goalie James Lewis. Ebert tapped the rebound into the open net and secured the Rocketeers a much-needed, come from behind 3-2 victory that pulls North back to .500 on the season. Through two periods it didn’t look like the Rocketeers would need late heroics to pull out the win. North grabbed an early lead on a two-man advantage inside the opening five minutes of the game. Will Yeomans had the initial shot from the slot that Lewis (28 saves) was able to get a piece of but not fully collect. The puck fell behind the goalie and Justin Moccia was in the right place at the right time to tap it in. It took the Warriors more than nine minutes before they recorded their first shot on goal. Jack Coulter picked off a cross-ice pass and forced Ryan Warren (20 saves) into his first stop of the night. The Rocketeers kept pushing for a second goal. A scrum in front forced a last-ditch, goal line clearance by KP defenseman Kyle Gray. With a minute left in the first, Lewis was forced into two reaction stops to deny both Jack Connolly and Ebert from point-blank range. In the second period, the Warriors struggled to stay out of the box. KP picked up four penalties in that period alone, including a five-minute major that carried over to the third. Joe Boselli had a good look dragging the puck into the slot but he shot over the net and then Luke D’Amico forced Warren into a good glove save from a tight angle. Jake McNeany tested Lewis with a shot from the point that was kicked aside and Todd Robinson set up Connolly for a tip on the edge of the crease but it was sent just past the post. North led 19-10 in shots heading into the third period and with 4:51 remaining on a major penalty, the Rocketeers looked like they were in control. But, KP stormed out of the locker room looking like a completely different team and, despite being down a skater, started to take the game to the hosts. Ryan Fitpatrick missed the net on a backhand seconds into the third and Warren was forced to make a sprawling save to deny Brendan Shandley when the rebound caromed to him at the far post. North nearly doubled its lead seconds later when Robinson’s shot forced a save out of Lewis and Connolly flicked the rebound wide of an open net. That miss looked costly as KP skated down the other end and tied the game. Coulter had the initial shot from the right circle and Boselli was right there to follow up the rebound to make it 1-1. Both teams continued to get chances in an end-to-end period. Robinson had a shot tipped inches wide by Ebert in front and Anthony Zammiello set up McNeany but his shot was blocked in front. Rocco Bianculli tested Warren with a blast from the edge of the right circle but the goalie got his blocker to it and Shandley forced another save that left the North defense scrambling. With 5:47 to play, KP stunned the home crowd by grabbing the lead. Coulter played the puck into Conor Cooke, who was parked in the slot with a defenseman on his back. The forward collected the pass, spun, and ripped a shot over the shoulder of Warren and into the roof of the net to make it 2-1. Rather than get down, North turned the game around again. After KP cleared off yet another penalty (its eighth of the game), North got space in transition with Connolly finding a lot of room on the left circle. He opened his body up and went top shelf, far corner to beat Lewis and tie the game seemingly out of nowhere. Zammiello hit the post from a very tight angle a minute later and then Ebert popped up 30 seconds after that with the dramatic finish that North needed to pull out a crucial two points at the midway point of its season. North Attleboro (5-5, 3-1), which is just a game back of Canton in the Davenport title race, will travel to Oliver Ames on Wednesday, while King Philip (6-5, 2-2) will get a week off and be right back at the NESV to face Attleboro. Franklin, 55 vs. Bridgewater-Raynham, 47 – Final – Franklin started and finished strong in the championship game of the Larry Fisher Holiday Tournament to beat the hosts. Franklin junior Steve Karayan connected on six three-pointers, including two in the first and two in the fourth quarters, for a career-high 18 points. The Panthers led 36-34 heading into the final quarter but outscored the Trojans 19-13 in the frame to pull away with the win. Senior Jalen Samuels added 14 points and was named tournament MVP while senior Jake Macchi added a career-high 12 points. Oliver Ames, 51 vs. Cardinal Spellman, 45 – Final – Oliver Ames limited the Cardinals to four points in the second quarter to build a 25-14 advantage at the break, and took a 40-26 lead into the final frame but had to hold off a furious charge from Spellman to earn the win. Spellman cut the lead to 48-45 with 31 seconds to go but OA secured the win in the championship game of the Muscato Holiday Tournament. Senior Ethan Eckstrom scored 13 points and was named tournament MVP while junior Jay Spillane also scored 13 points for the Tigers. Sharon, 61 vs. Walpole, 58 – Final – Click here for a recap and photo gallery of this game. Foxboro, 63 @ Hopkinton, 23 – Final – Click here for a Photo Gallery from this game. Lizzy Davis led the Warriors with 16 points, while Katelyn Mollica had 15 and Yara Fawaz added 10. Shakirah Ketant came off the bench to add seven points, nine rebounds, and four blocks for Foxboro, which didn’t allow a made field goal during the second and third quarters. Mansfield, 40 vs. Ridgefield (Conn.), 32 – Final – Mansfield led by just two points entering the fourth, but pulled away by holding Ridgefield to only five points in the final quarter. Defense was the key for the Hornets, who led 20-10 at halftime despite shooting 0-for-16 from the field in the second. Sydney Mulkern had 14 points and Maggie Danehy recorded a second double-double in as many days with 10 points and 14 boards. North Attleboro, 49 vs. Dighton-Rehoboth, 55 – Final – Amanda Kaiser led the Rocketeers with 22 points in the consolation game of their holiday tournament. Attleboro, 26 vs. Norwood, 39 – Final – The Bombardiers played even with unbeaten Norwood in the second half but couldn’t overcome a tough start on the offensive end after falling behind 21-8 at halftime. Liv McCall scored a team-high seven points and was named to the all-tournament team. Nyah Thomas added six points for Attleboro. Attleboro, 2 vs. Dartmouth, 2 – Final – Attleboro rallied for a pair of third period goals to earn a tie with Dartmouth. Cam Littig scored twice in the final period to bring the Bombardiers level, with Ryan Morry assisting on both goals. Sam Larkin and Aidan Diggin also had an assist for Attleboro. Canton, 4 vs. Westwood, 0 – Final – Canton’s Ryan Nolte and Johnny Hagan scored in the second period and Timmy Kelleher and Chris Lavoie tacked on goals in the third period as the Bulldogs claimed the Joe Donnelly Cup with a win over Westwood. Foxboro, 8 vs. St. John Paul II/Sacred Heart, 2 – Final – Kirk Leach picked up five points and Ronnie MacLellan registered four points as the Warriors skated to a win in the championship game of the JP2 Hockey Classic. Leach scored twice and picked up three assists while MacLellan was responsible for one goal and three helpers. Franklin, 2 vs. La Salle College High, 5 – Final – Click here for a Photo Gallery from this game. King Philip 7, vs. Brockton, 4 – Final – King Philip scored four goals in the second period, turning a deficit into a lead, and tacked on two more in the final period to get the win over the Boxers. Senior Luke D’Amico put the Warriors on the board in the first but KP trailed 2-1 after one. Goals from Brendan Shandley, Rocco Bianculli, Aiden Boulger, and Garrett Maxwell helped the Warriors take a 5-4 lead into the final period. Jack Coulter and D’Amico scored insurance goals in the third period while James Lewis finished with 14 saves in net. Canton, 1 vs. Westwood, 5 – Final – Lauren Fitzpatrick scored Canton’s only goal. Mansfield/Oliver Ames, 4 @ King Philip, 3 – Final – King Philip scored early in the third period to go up 3-1 but Mansfield/Oliver Ames rallied for three straight goals, including the game-winner with just over a minute left to pick up a win over the Warriors. Sydney O’Shea and Morgan Cunningham scored first period goals to put KP up 2-0. Izzy Shanteler got MOA on the board in the second but Meghan Gorman made it 3-1 with an early third period goal. But Emma Pereira scored with 10:47 left, Shanteler got her second with 5:10 to go, and Pereira tallied her second with 1:04 to play for the game-winner. Skyler Sharfman had two assists for MOA while Jess Widdop made 18 saves in goal. Agawam Tournament – Franklin had eight wrestlers finish fifth or better and took fourth overall as a team with 145 points. Drew DiFilippo was the 106 champion, winning 13-8 in the finals over Moses Oquendo of Holyoke. Alex Facassa (126) and Liam Cogavin (182) each took second, Matt Leofanti (220) earned a third place finish, Luke Cashin (152), Nolan Sheridan (195), and Quinn Fila-Montgomery (113) each placed fourth, and Michael Hasenfus (132) took fifth overall. BROCKTON, Mass. – With 11 players back from last year’s squad, King Philip head coach Paul Carlow was hoping a strong start to the season was in the cards for his Warriors. After one game, so far so good. King Philip scored a pair of goals in the opening period of its season and added one more in the final minute of the game to come away with a 3-0 decision over Oliver Ames at Asiaf Arena. Each team had a good scoring chance inside the first six minutes of the game. After that, King Philip controlled the majority of the play and cashed in twice just over two minutes apart to build a lead. King Philip senior goalie James Lewis (23 saves) turned away a pair of early OA shots while Tigers junior netminder Owen Connor (25 saves) denied the Warriors on a one-time bid off the stick of Joe Boselli (set up by Jack Coulter) to keep the game scoreless through six minutes. The Warriors continued its offensive pressure and capitalized on a rush at the midway point of the period. Senior Garrett Maxwell connected with senior Brendan Shandley in neutral ice, and the latter took control into the attacking zone. Skating down the right side, Shandley flipped the puck on net with a tough angle and the puck caromed off of the OA netminder and into the back of the net for a 1-0 advantage. A couple of shifts later, the Warriors’ first line was at it again. A strong forecheck resulted in possession behind the net on the stick senior Ryan Fitzpatrick. Before the Tigers could get a defenseman to pressure him, Fitzpatrick alertly dumped the puck back in front, hitting the back of Connor’s skate and into the net. Shandley and Luke D’Amico were credited with assists. “The boys work hard, we do a lot of skating and a lot of conditioning,” Carlow said. “Having that extra line helps [with the energy]. They came into the season prepared and it showed. Oliver Ames came out strong in the second period and had two very good chances to cut into the deficit but Lewis came up with two huge stops to preserve the two-goal lead. First, junior Jake Gottwald drew a defenseman to the right side before turning and firing a pass to senior Max Ward right in front for a one-timer. Lewis got just enough of his glove to the puck to keep it out but OA kept possession. Ward eventually got back on the puck behind the net and tossed it right in front to Colin Bourne for a one-timer but Lewis got the pad to the close range bid to keep it out. The Tigers’ momentum was squandered by a cross checking penalty with 12:28 to play in the period. KP only had one solid chance on the man-advantage when Coulter nearly put a shot in the net but the puck didn’t get past the line and OA cleared it away. Although Connor and the OA defense turned the Warriors away on the power play, the momentum stayed with King Philip for the rest of the period. The Warriors had strong spells of possession using al three things. The best chance coming at the midway point when Chris Daniels found Boselli but his shot slid just wide. Connor made a terrific toe save early in the third period to keep a shot from Aiden Boulger out of the back of the net and OA nearly staged a comeback over the following minutes. Lewis squeezed the pads to deny a one-time chance from Ward after a nice centering pass from Brad Powers. And then Lewis denied a shorthanded breakaway from Cullen Gallagher at the midway point of the final period to keep the Warriors up 2-0. Oliver Ames had a variety of man-up opportunities throughout the final period, skating 5-on-3 briefly before taking a penalty of their own. During a 4-on-3 stretch, both James Beatty and Ward had chances turned aside by Lewis. The Tigers kept possession in the attacking zone but Lewis continued his strong play, knocking aside another Beatty shot with his blocker and snatching a bid from Gottwald with the glove seconds later. Coulter iced the game with an empty net goal with 29 seconds to play. 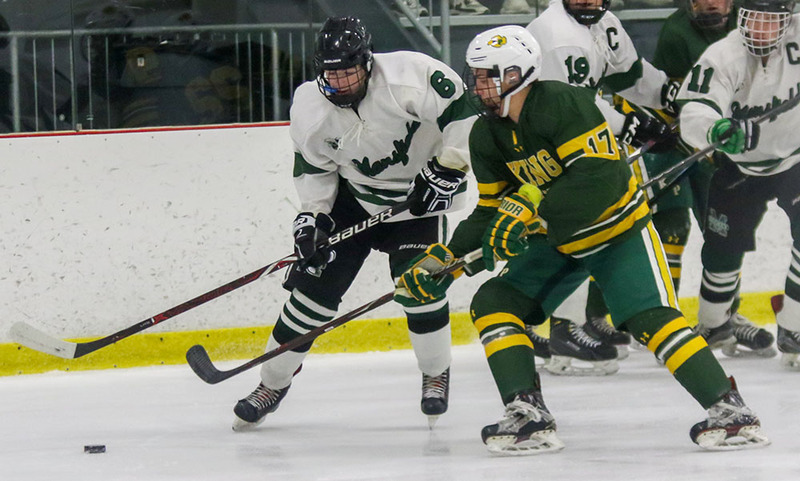 King Philip hockey (1-0 overall) is back on the ice next Wednesday when it hosts Coyle & Cassidy at 5:40 at Foxboro Sports Center. Oliver Ames (1-1) hits the road to take on North Attleboro on Saturday in a non-league clash. FOXBORO, Mass. 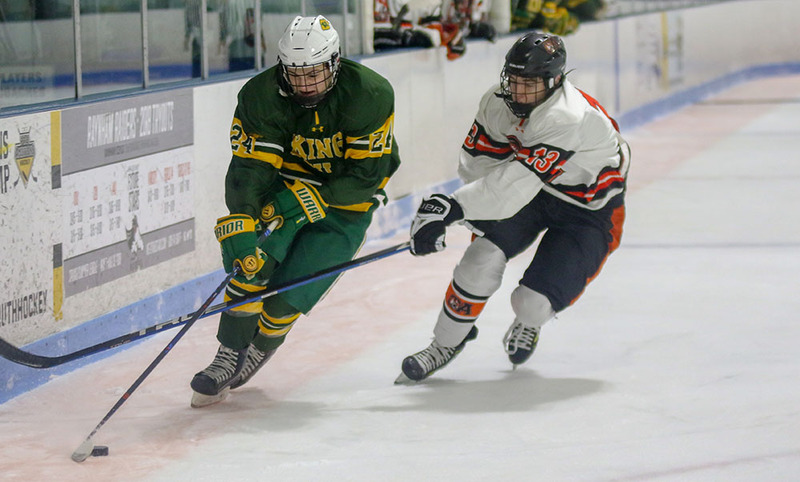 – With 1:19 left in the second period, King Philip took possession in its defensive zone and with one pass turned it into a breakaway to tie the game at 2-2. The home team seemed poised to have all the momentum heading into the third until North Attleboro junior Andrew Wissler hustled the Rocketeers back into the lead. Erik Clements flicked a puck over the top, just trying to relieve the pressure from the Warriors and clear the zone. KP defensemen were caught up the ice and Wissler flew past them to chase the puck. Sophomore goalie James Lewis was forced to leave his crease to try and play it, but Wissler beat him to it and tapped into the vacated net for his second goal of the night. The goal provided a huge boost to North, which took momentum and carried it into the third where the Rocketeers added am early power play goal to take control. KP rallied with a late goal and a flurry of chances in the final 90 seconds, but North held on to win 4-3 and moved within one point of the program’s best single season total. “All-in-all it was a good effort. We were down six guys with the flu and I know they were battling the same thing, so it’s tough to get the guys ready to play when half the team is sick and playing with new players, but I thought they adjusted pretty well,” said North coach Steve Snizek, who highlighted sophomore Kyle Bolgerhaving to move from forward to defense for the game. North jumped in front inside the opening three minutes. Zach McGowan drove the puck down the right wing and all the way to the edge of the goal before sending a pass into the slot for Wissler to one-time it. The Rocketeers outshot KP 8-7 in the period, but the Warriors had their chances, including an opportunity for Luke D’Amico stepping up into the rush on a two-on-one with Gavin Maxwell, but his shot was saved by Ryan Warren (17 saves). North’s best chance to double the lead was a chance by Clements from the right circle but Lewis (25 saves) made the stop. KP tied the game three minutes into the second. Again it was Maxwell with the rush and Warren made a huge pad stop to deny the break only to see the rebound pop out to the stick of Collin Cooke and the junior forward roofed it. Lewis tried to make the score stand up, stopping three shots (at least) in a huge scrum on the edge of his crease. However, two minutes later, there was nothing he could do to stop Clements. The senior went top shelf with an unstoppable wrister from the circle for a 2-1 lead. With 2:34 left in the second, the Warriors again bounced back to tie it, despite being outshot 13-6 in the period. Garrett Maxwell picked the perfect outlet pass right on the tape of Jacob Kelly as the senior burst through the neutral zone. Kelly went racing in on Warren and beat the goalie five-hole for a 2-2 tie. The game was only tied for 1:15 before Wissler showed off his speed and his tenacity to regain the advantage for North Attleboro. The Rocketeers came flying out of the gates in the third and got a power play opportunity. Brendan McHugh worked the puck down to Clements who had a chance blocked in front of Lewis, who had already made four saves in the period, and it caromed out to McGowan. The senior buried his one-time shot into the bottom corner for a 4-2 lead. Although North had the two-goal edge, the game was far from over. KP continued to press to try and get back into it and Gavin Maxwell had a golden chance in the final minutes when he got behind the defense for a breakaway only to be denied by Warren. The one that got away came with 1:37 remaining. Kelly got free on the right hand side and was able to put a shot on goal as he was falling down. The puck did not have a lot on it but was able to squeeze through the goalie’s pads. The whistle blew with KP looking for a penalty and North assuming it was saved, only for the refs to point to center ice. The Warriors pulled Lewis for the extra skater and had a series of face-offs in the North end, but could not find the tying goal. 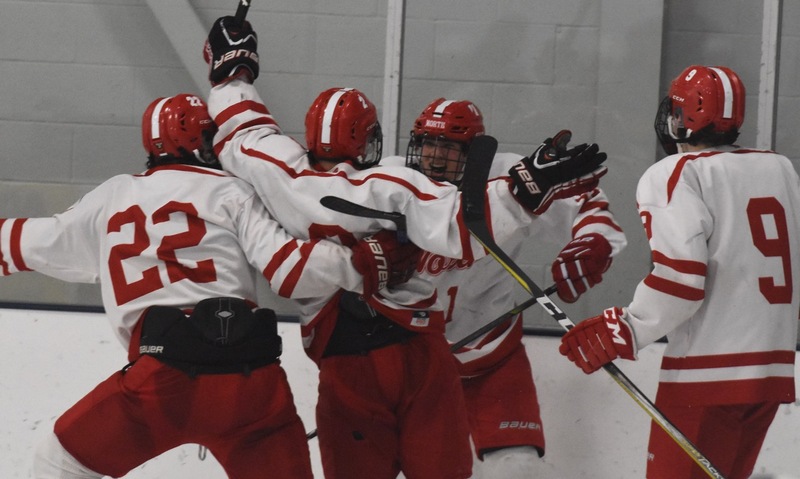 North Attleboro (12-3-3, 6-2-1) now has 27 points, one shy of last year’s program-best 28, with two games remaining. The Rocketeers will get a good playoff preview on Saturday with a trip to Medway. King Philip (4-14, 4-5) suffered its third one-goal loss of the season. The Warriors will travel to Norwood on Saturday.